A paper-free office is more than contributing to an eco-friendly platform. Rooms filled with file cabinets containing hundreds of files dating back years not only contribute to the dust problem in your office, but they also take up space, and in an age where business has increasingly become timely, it makes your office slightly inefficient. Then, imagine how much money you can save in toner and copy paper by going paper-free. Going paper-free will mean organisation in your office while making it easier, efficient, and more productive to complete tasks. Converting your office to a paper-free one is not as difficult as it was in times past. Technologies have made it possible for businesses to use online software to move their entire office into the online format. Keep reading to learn how you can transform your office into a paper-free space. One of the best ways to move your business into a paper-free office is to invest in accounting software that more than does separate tasks but is an integrated system that can help make work efficient. Many accounting programs can integrate information from bank and credit card statements with paying invoices and receiving payments. Furthermore, this software can be used to keep track of customer history and ageing and vendor and aging tasks. Ultimately, in a perfect system, you only have to print reports to review the information, as even software that wholly relies on manually inputting data into a program has become antiquated. While it might be easier to use separate programs for a million different functions, finding a system that allows you to coordinate many tasks into one platform is probably the most efficient way to create an office. An online platform can allow you to complete a number of tasks under one umbrella, tasks that include communicating with employees, paying employees, record-keeping, assigning tasks, and receiving submissions for any work. Building a platform from which to house your business affairs makes it possible for you to access your office from any location. Another space saver and time saver is moving hard copy files to an online storage system. 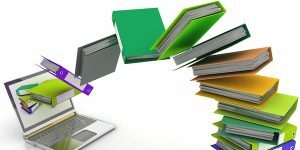 Simply scan documents to a file on your computer and then create a system for storing these files. If working in teams, you can use cloud-sharing applications to make the files accessible to team members, which makes working remotely much more efficient. Finally, it frees up a lot of space in your office, so you can either downsize to meet the needs of your new paperless office. Another time-saver is the ability to sign documents online and have them delivered. This program reduces the amount of time that it takes to get documents signed. With an e-signature program, you do not have fumble with packing slips, and the program reduces the amount of money on courier services used to transport documents to your office. Again, this paper-free method of getting work done can translate into more productivity. If not comfortable using an e-signature program, create an online signature that will function in the same way that e-signatures do. In this way, you create a more accurate signature that can be used for business when needed. Essentially, by getting your signature on file you can easily sign contracts, permission slips, and invoices, and this signature can be imported easily to your mobile phone. Incorporating technology into office design is one way to maximise the space that you do have. Extra locked filing cabinets and furniture used to store supplies take up valuable space. Furthermore, they add to the clutter that can make an office appear disorganised. Ultimately, though, by saving space you save time, money, and make work more efficient, but moreover, you creative productive space. « English to Dutch translation at affordable rates!